How do potential customers find your business? Are they familiar with your business, or do they find you by doing research? For a long time, people went to Yellow Pages to find local businesses. If you wanted someone to fix a leak in your sink, you looked under "home improvement" and called a plumber. Yes, small businesses still get leads from the Yellow Pages, but it's clearly not the place people choose to look anymore. Today, more people who are unfamiliar with your business are going to a search engine and typing words like, "plumber, Des Moines, Iowa." A large study of behavior by Comscore, Local Search Marketing in a Multi-Tasking World, shows a fundamental shift in the way people are looking for products or services in their area. 34% of customers shop online before they ever get to the store. 82% of local searches contacted a local business; 60% making a purchase. Some 93% of local search conversions take place offline. Over 64% of people who are looking for information use search engines. U.S. online shoppers will double to 132 million in the next five years. 86% of customers read online business reviews before making purchasing decision; 90% of these customers say they trust these reviews. No wonder print advertising is suffering. This is why I'm always surprised how much some businesses seem to value print ads. It appears the best ways small businesses can capture new business is by improving their search results in search engines - specifically through local search. At America's Best Companies, our search engine specialists do all the work so you don't have to. 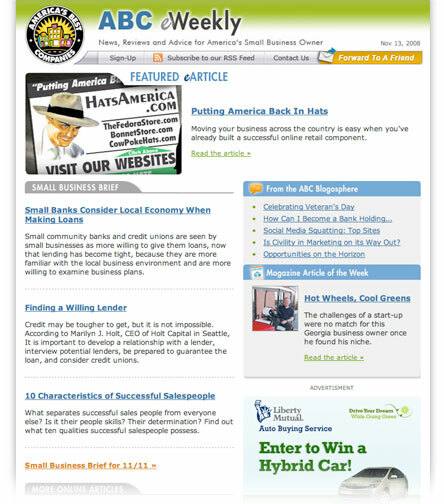 ABC launched EZlocal.com not only as a way to help recognize the unique products and personal services that local business owners provide every day, but also as a powerful tool designed to help your business profile get published higher in search engines like Google and Yahoo!. Furthermore, with EZlocal, you can create a robust profile of your business including a detailed business description, in-store specials, product or store images, hours of operation, types of payments accepted, driving directions powered by Google Maps, custom printable coupons and much more. Plus, every element added to the EZlocal business listing increases placement and visibility on more than 40 of the top search engines. Start with a free basic profile of your business and if you like what you see, upgrade to EZlocal Premium later and truly maximize your exposure.